Eric inspires audiences through powerful and entertaining personal stories. 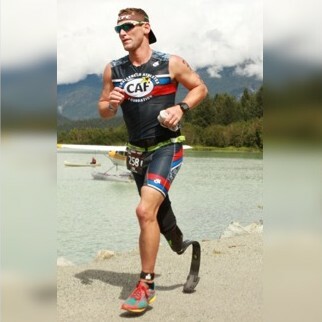 While serving as a Marine in Afghanistan, Eric suffered the loss of his right leg after stepping on an explosive. His presentation shows us how embrace our own challenges. Format: ​45-60 minute Keynote presentation. Eric's signature talk explores the characteristics, traits and actions he found most useful in his journey from the hospital bed to the Ironman World Championship finish line. During this presentation, Eric gives his audience tools and techniques to overcoming life's obstacles through funny and emotional stories. This program is perfect for: ​Corporate Events Meetings/Conferences Schools and Universities Athletic Teams The audience will leave with: ​Skills to adapt to changes and challenges Tactics on how to develop a mindset to achieve more than just the 'bare minumum' Ability to look for the 'positives' that come from any situation ​*Eric personally tailors each presentation to fit the needs of the event planner. Eric also loves spending time, both before and after the event, with the team members and audience to form great relationships.